Keïta is a retelling of the first third of Sundjata Keita's 13th-century epic, Sundjata. 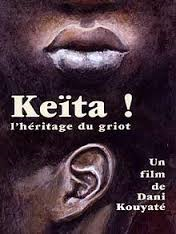 It tells of Mabo Keïta (Dicko), a thirteen-year-old boy who lives in a middle-class family in Ouagadougou and attends a good school. When a djéliba, a master griot or bard, arrives mysteriously at the home of Mabo Keïta to teach him "the meaning of his name," the boy and griot are inevitably brought into conflict with his Westernized mother and schoolteacher, who have rejected African tradition. The griot reveals to Mabo the story of his distant ancestor, Sundjata Keïta, the 13th century founder of the great Malian trading. Fafa D. "Keita! L'héritage du griot" Internet Movie Database reviews.